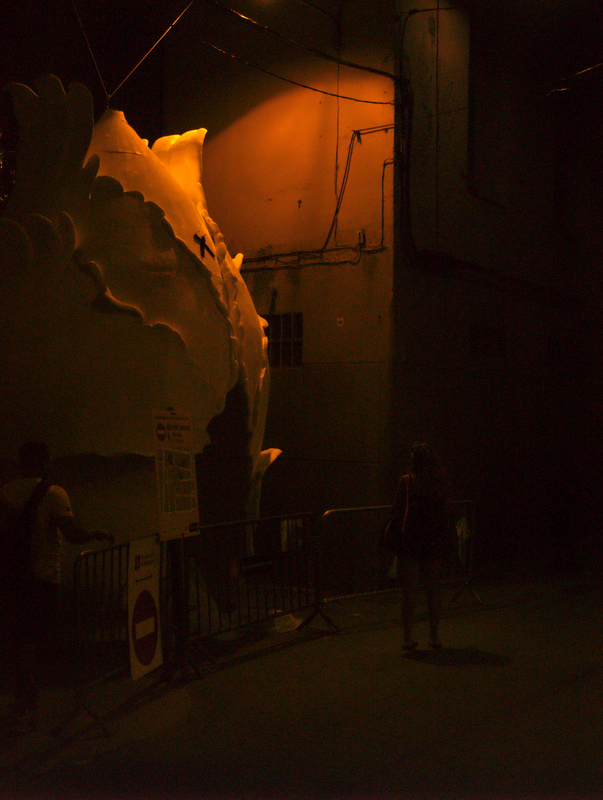 When I last wrote for this blog we were having a good time at “La Festa” – mild injuries notwithstanding. This was, as we all know by now, rudely interrupted by the terrible event which took place on La Rambla on the 17th of August. Our thoughts, as the PRACE Summer of HPC team’s Barcelona division, go out to the victims of this vain act and to the great city to which I here venture to pay tribute by describing what is always glossed over – the day-to-day life in the aftermath of the attack. Day-to-day life in Barcelona is perhaps not that different than in any other major city in Europe. Doubly true for scientists such as me and Aleksander since science is our daily bread, seasoned with culture and garnished with adventure here and there. This life is certainly a major break from the quietness and cleanliness of the small town of Tübingen, which I call my home! 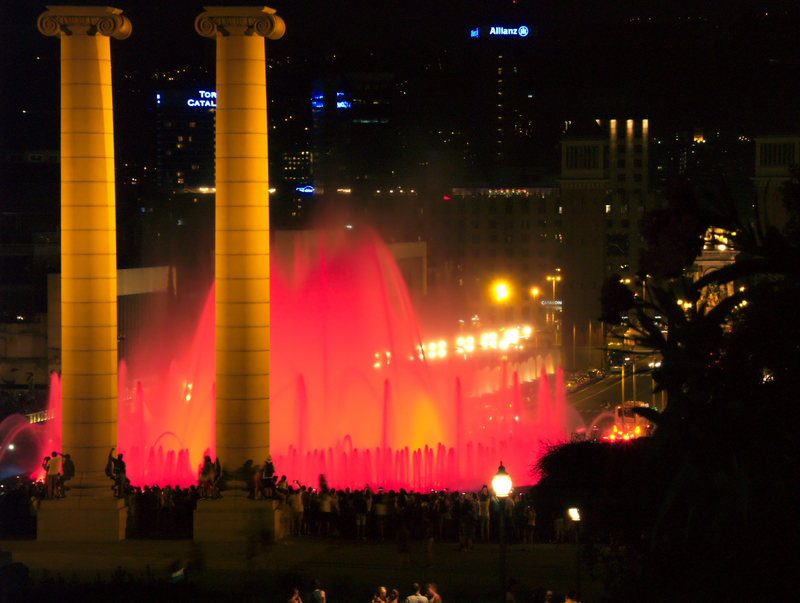 The normal size of the crowd at the fountain show in front of the MNAC. On the whole, one goes to work, enjoys the time after working hours and perhaps complains of the heat here. Since the sun is relentless during the day life in this great city only truly starts after around 17:30, when the outside becomes bearable. With thousands of tourists being off-loaded by cruise liners periodically and hundreds flying in, the city is mostly geared towards them – at least the city centre. Especially the old city, Ciutat Vella, is almost entirely taken over by tourists now. You can’t go 200 m without hitting a restaurant, ice cream parlour or a coffee shop. Street performers and pedlars abound, too, in the tourist spots. Small LED launchers are, apparently, the hot item of this summer during the evening hours, closely followed by beer and water. By the way – our favorite ice cream spot was just in front of Sta. Maria del Pi, a stone’s throw from the Liceu metro station on line 3. Beware! English language coverage drops off rapidly with distance from the main touristic spots, and even there it is not exactly perfect. So some basic Spanish or, even better Catalan, is advisable when coming here. You can survive without, but it was quite a challenge for me to piece the meaning of the sentences from my patchy knowledge of French and Italian, with English as glue. 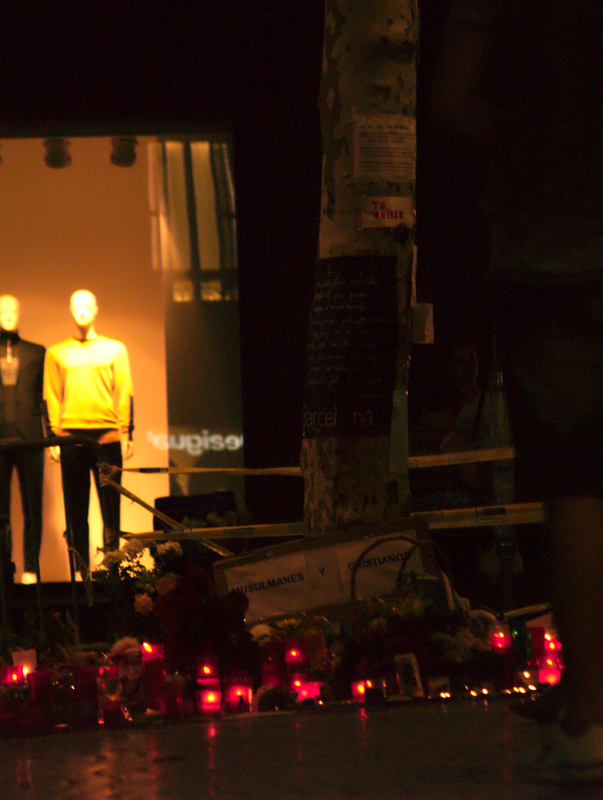 At 2300 on the 17th people are still milling around in Gracia – fewer than normal, though. On that day, I decided, once again, on walking home from the BSC instead of taking the metro. Thus I was lucky to avoid being stuck in the metro near the place of action, seeing as our everyday transport – line 3 – passes straight under the fated boulevard. It was not until I was home at the Residencia Universitaria de Lesseps that I noticed the warning about the attack, sent to me by Aleksander. Severe as the incident was, its influence was not immediately perceptible. That is the one positive thing one could say about this type of attack. 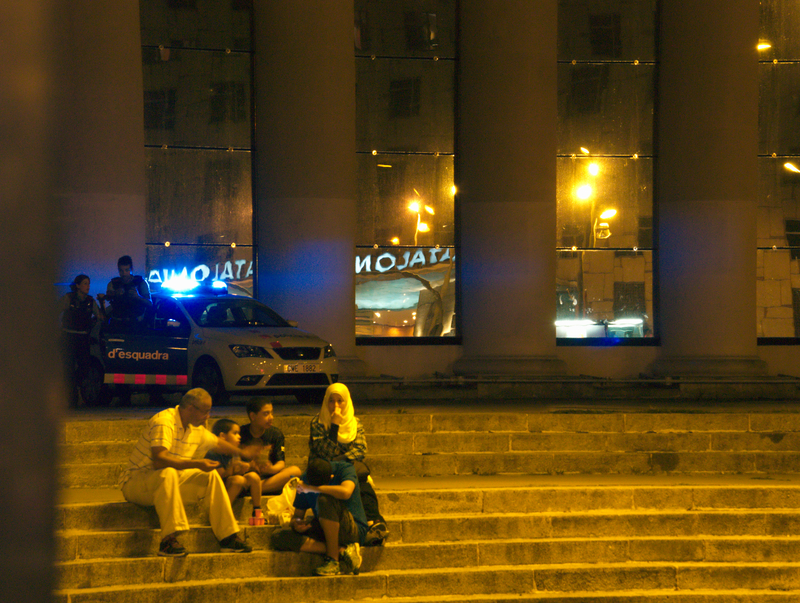 Its potential for causing a mass panic in a city as large as Barcelona is rather low. Being just 3-ish km away from the place of action the attack was not perceptible. The festivities canceled for the day Gracia was quiet – with few still admiring the decorations. people at midnight was smaller than it normally would have been, but the streets were far from being deserted. The morning after came around. Friday – the last day of work for the week. Leaving for the BSC, as was my custom, at around half past eight I found the metro to be a bit less crowded than it normally was. It did not halt at neither Catalunya, nor at Liceu – the terminal stop of the van the day before. As the clock struck twelve all were suspended in a minute of silence for the victims of the attack. By the time I was returning home at 1700 both stops were being served again and the metro was as full as ever, though definitely more solemn. It is a tribute to the local people, that life returned to normal as fast as it did without any major “knee-jerk” reactions. I truly admire the people here for their measured response! Certainly, there was more police deployed throughout the city during our final week in Barcelona, but except for that, life was returning to normal by the evening of the day after. 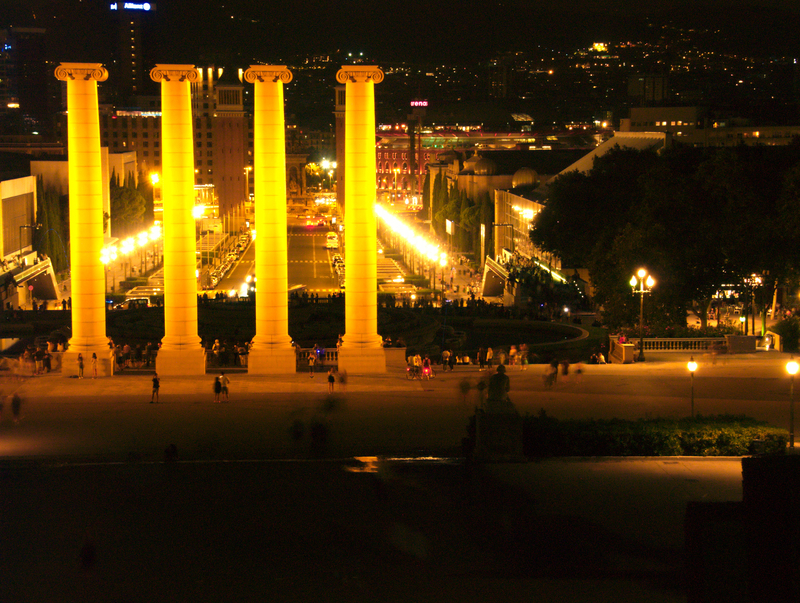 The Font Magica de Montjuic was far from deserted on the third day of mourning. Even though no show was to be held. I decided to visit Pl. Espanya again. The sky promised great opportunities for images. Late to leave, I had missed the sunset and was left to make do with dusk. The steps before the Museo Nacional de les Arts Catalanes (MNAC) were full, though all official performances were suspended during the 3 days of mourning. There it was immediately obvious, that a terrible incident took place, since the crowd was quite a bit smaller than normal. No fountain show was to be expected but apparently this did not reach the ears of many tourists, since a lot of those present clearly expected to be entertained. I pity the local police for having to answer the same question over and over again. It is a silver lining on the horizon that the original plan of the group literally blew up in their faces and the attack carried out afterward was improvised. 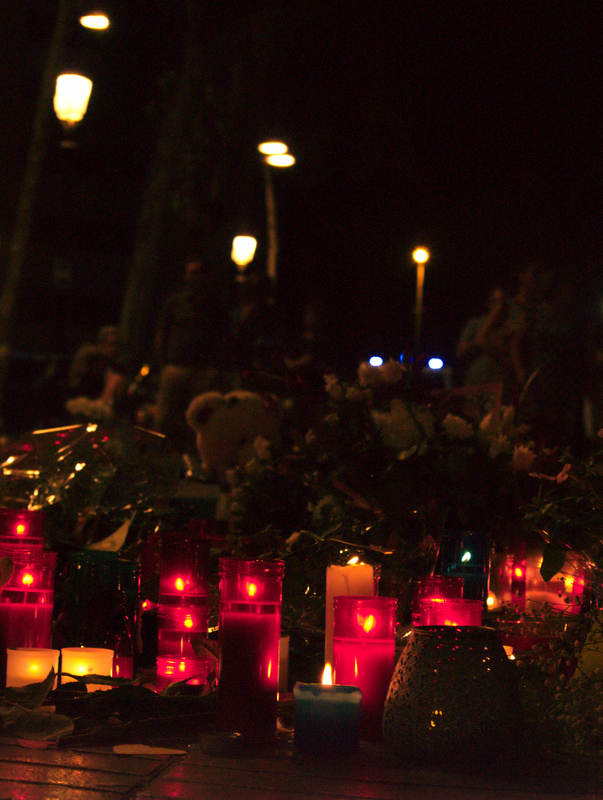 Had the attacker shown up just half an hour later, or even a day later, the number of victims may very well have been a lot higher, since – due to the weather – the tourist spots do not get well populated before 1700. Aleksander trying to revive his phone for pictures at the display of Fraternitat de Dalt during the final day of La Festa. Almost midnight and still a lot of visitors! With the end of the official mourning period the city life definitely returned to normal. Entertainment and vigor were back on the menu inviting any- and everybody to participate in the very lifestyle the terrorists were attempting to disrupt. True to this motto we have continued to pursue the completion of our projects in the little time that we still had in this great city. Nothing shall change the academics’ lifestyle – semester break is when you get work done! Extra security deployed after the attacks (here on the 20th). Telling tourists there will be no entertainment at Font Magica has got to be irritating! Mourning the victims of the attacks across religions. After the attacks people of Barcelona stand united against terrorism. 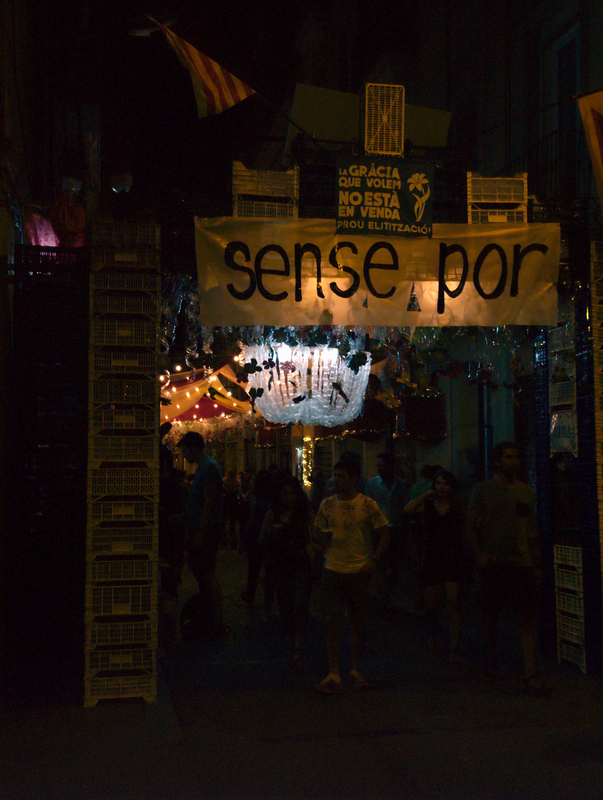 All things come together at la Festa – opposition to tourists and tourists alike, without fear – sense por! 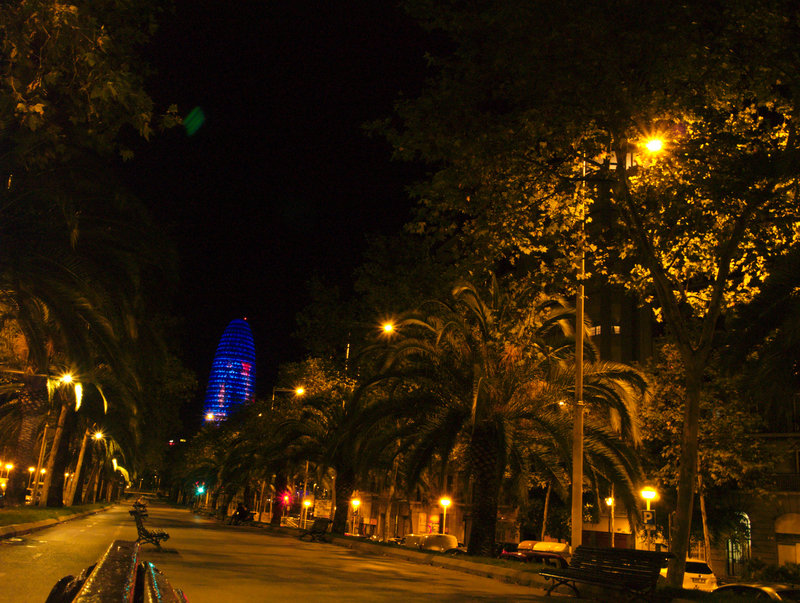 Torre Agbar at the Plasa de les Glories Catalanes as seen from Av. 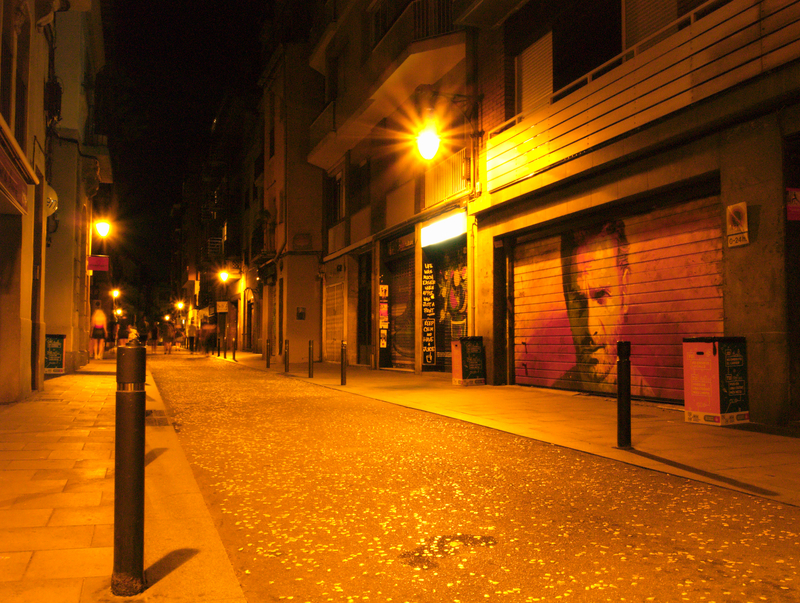 Diagonal – the streets aren’t empty even at 1 o’clock.